Simple.com founder Joshua Reich wants to get rid of everything customers hate about bank accounts. NEW YORK (CNNMoney) -- Thousands of dissatisfied customers broke up with their megabanks this fall, and many more say they would leave if they can find a decent alternative. Enter Simple.com, a new online service that wants to replace your bank. Formerly known as BankSimple, the two-years-in-the-making venture opened last month to its first small batch of early customers. The site has a straightforward but wildly ambitious goal: Get rid of everything customers hate about banking. At Simple, a real person will answer your phone call directly -- the same person every time if possible. You will get intuitive Web and mobile apps that can field natural-language questions like, "How much did I spend on taxis in New York last month?" And you'll get it without any of the surprise fees customers hate. No monthly account fees, no overdraft charges, no debit-card fees or charges for using another bank's ATMs. Here's the catch: Simple.com isn't a bank. A Simple account is intended to look and feel like a traditional checking account, but it's actually an online interface that sits on top of a back-end powered by a collection of traditional, FDIC-insured partner banks. Those banks hold customers' deposits, while Simple handles all the details that users actually see. It's like a bank that outsources the actual banking. 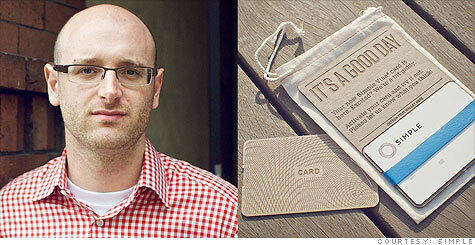 Simple CEO Joshua Reich, a self-described "data geek" with an MBA, began his quest to reinvent banking in late 2009. A snafu with his bank left him venting his frustration in a blog post. It ended with a promise: "As soon as I get my $11 back, they will no longer hold any of my accounts." Soon after, he left his finance job to build Simple. Reich assembled a team that includes Alex Payne, a former lead developer at Twitter, and CFO Shamir Karkal, an MBA who also has a computer science degree. Simple then surveyed 14,000 banking customers to find out what they wanted fixed. "People would get into a lot of details," Reich says. "They were really emotional." The number-one request from survey respondents: A better Web experience. People were fed up with slow, hard-to-navigate sites, and they wanted better mobile apps than most banks offered. Like Reich, they were also fed up with fees. Doing without those fees is Simple's biggest and trickiest goal. The company plans to make money by sharing in its bank partners' interest margin (the profit collected on lending money) and their interchange fees on customers' debit card transactions. "Banking in America has gone too long on a revenue model driven by customer confusion," Reich says. "We make money when our customer makes money." The problem is that those revenue streams are razor-thin. Interest rates are hovering near record lows, and the government recently capped the "swipe fees" banks can collect on debit transactions. Big banks yelped about the change, saying that the new fees aren't enough to cover their costs. Banking analyst Bert Ely is skeptical about Simple's prospects. He's watched online-only banks like NetBank fail, and says he's never seen a return on equity from them that was anything to get excited about. "I've seen lots of promises, and most of them just don't pan out," Ely says. To him, Simple looks like one banking company operating on top of another competing one. "How can there be enough spread in there?" he challenges. "Maybe I'm old-fashioned, but I'm only impressed by business models that make money." Reich insists that Simple has run the numbers and thinks it can sustain its business model. Some venture capitalists share his optimism: Simple has raised $13 million from a high-profile collection of investors, including IA Ventures and Shasta Ventures. The company's early partners are also bullish. The first actual banks powering Simple.com's service are CBW Bank and The Bancorp Bank. Bancorp specializes in "private label" banking, meaning it frequently provides financial services under a partner's brand. Pete Chiccino, Bancorp's chief information officer, says the financial split Bancorp has arranged with Simple is on par with the bank's other partnership arrangements. He's a fan of the startup's vision: "The things they are doing from a customer standpoint are way ahead of their time," he says. Simple's service is currently in a limited test stage, and Reich declined to say how many customers the company currently has. But it's got an enviable pipeline of prospects: Simple already has 90,000 requests queued up for an account. Simple plans to keep its marketing costs low by relying heavily on word-of-mouth recommendations. Members "will tell their friends and family about Simple," Reich predicts. "We think our customers will be happy." That's a line you don't hear too often from bank executives.